You see them scurrying across the porch, into pipes, or just about anywhere you happen to look--fields, desert, alpine woods, the city. A flicker of brown fur--there, and then gone. Chipmunks, those lively speed-demons of the squirrel family, keep busy gathering food for their lairs--and how and what they gather is all part of a "day in the life" of the common chipmunk. North America's 25 species of chipmunks are found anywhere from Canada to Mexico, and they may live either in burrows, with tunnels and chambers or in nests, bushes or logs. Squirrels can be gray to reddish-brown in color, with dark and light stripes on the sides of their faces and across their backs and tails. The smallest chipmunk is no more than 8.5 inches tall, while the largest (the Eastern chipmunk) is about 11 inches in height. 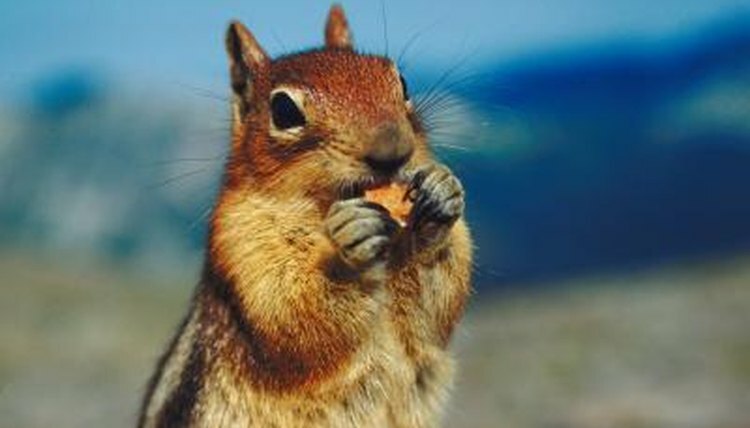 Chipmunks are omnivores, meaning they eat foods of both plant and animal origin. In the fall, you can watch them gathering acorns, and in the spring and summer they often feed off the seed contained in bird feeders. Their diet consists of different types of nuts, berries and other garden fruits, as well as bulbs, seeds and mushrooms, and they can be quite destructive to gardens. While they also eat insects and carrion, they in turn become prey for various predators. Chipmunks usually seek out food on the ground. Favorite areas to comb include underbrush, rocks and logs. These low-down areas allow them to hide from such predators as hawks, foxes, coyotes, weasels and snakes. The North American chipmunk stuffs grain and other morsels into its pudgy cheek pouches and carries his cache to a well hidden burrow or nest to be stored for the winter. Burrows often include a nesting chamber, a couple of food storage chambers and various tunnels. In the northern states, near the end of October, chipmunks go into their underground chambers and are relatively inactive during the winter months. While they sleep restlessly, they are not considered true hibernators like bears, who maintain a state of inactivity and metabolic suppression. Some chipmunks emerge from their lairs on sunny winter days, but most remain underground and rely on the berries, seeds and acorns they stored away in the fall. What Kind of Animals Live in the Alps? What is the Best to Feed a Chipmunk? Are There Groundhogs in Minnesota?